B. Lynn Goodwin owns Writer Advice, www.writeradvice.com. Her memoir, Never Too Late: From Wannabe to Wife at 62 was released in December and was a National Indie Excellence Award Winner and a 2-category finalist at Next Generation Indie Book Awards. She's also written You Want Me to Do WHAT? Journaling for Caregivers and Talent, which was short-listed for a Literary Lightbox Award, won a bronze medal in the Moonbeam Children’s Book Awards and was a finalist for a Sarton Women’s Book Award. Goodwin’s shorter have appeared in Voices of Caregivers, Hip Mama, Dramatics Magazine, Inspire Me Today, The Sun, Good Housekeeping.com, Purple Clover.com and many other places. She is a reviewer and teacher at Story Circle Network, and she is an editor, writer and manuscript coach at Writer Advice. 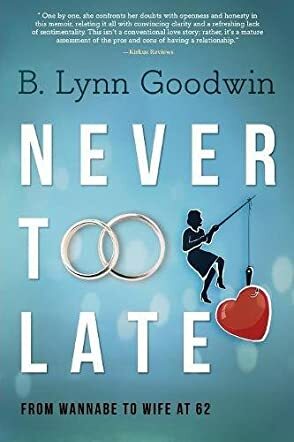 Never Too Late: From Wannabe to Wife at 62 by B. Lynn Goodwin is a memoir of Lynn’s journey in her sixties as a single woman to getting married for the first time. Never Too Late starts with Lynn talking about her life and how she reached the age of 62, single, unmarried, and a virgin. After having told her dating history in brief up to this point, the rest of the book is devoted to her and Richard’s dating and relationship. Lynn was an established professional when she met Richard through Craigslist. He worked as an electrical contractor and was also a pastor at a church. Although their backgrounds and histories are very different—him being married twice before and with several adult children—they connect at some level and continue dating slowly but surely. This is the story of their relationship and how it evolves with its ups and downs. Lynn is a very good writer and she has presented the story in Never Too Late: From Wannabe to Wife at 62 really well. The writing is candid and very engaging and she explains her thoughts and misgivings, especially regarding financial matters, every step of the way. I must admit that Richard’s character, although he does seem frank, is quite “traditionally Christian” where he truly believes he, being the head of household, ultimately has the final say in all decision-making after marriage. Although that idea would be impossible for me to stomach, Lynn appears to have made her peace with it and seems genuinely happy, so I was glad it worked out for her. In any case, whether one agrees with this couple’s specific beliefs or lifestyles or not, this is their mutual love story and makes for an interesting read.